Dracaena deremensis | Janet Craig Dracaena is a most popular indoor plant. It has attractive sword-shaped, leathery, dark green, shiny leaves. As the plant grows, it forms a cane-like stem with a cluster of leaves at its top. 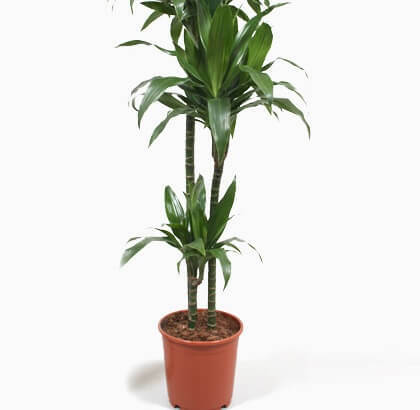 According to the NASA Clean Air Study, the Dracaena deremensis filters airborne toxins from the environment. The sap is poisonous to animals. It is not considered toxic to humans but should not be ingested. Keep it away from pets. Dracaena Janet Craig is a great choice for table plant, floor plant, or tall, stately tree. It grows best in the bright and indirect light. Avoid direct sunlight. Because direct sunlight will burn the leaves. In Indoors, keep the plants in an east or west-facing window out of direct sun or in a shaded southern window. They can be put outside during the spring and summer months as long as the location remains shaded. It thrives best in organically rich, consistently moist, well-drained potting soil. It prefers ideal room temperature between 65°F – 75°F / 18°C – 24°C. Under 55°F/12°C is going to harm the plant which may become noticeable if the leaves begin curling. Try and avoid the plant being near cold drafts, which will also cause harm. Water regularly, during the growing season. Always keep the soil moist, but not soggy. In winter, reduce watering. Allow the top 2-inch of soil to dry slightly to touch between waterings, but never allow the soils to totally dry out. Fertilize your plant once every two to three weeks, during the growing season with a balanced liquid fertilizer diluted by half. Prune it back in spring or early summer to control its growth. You can cut off the cane at any height. It will sprout a new cluster of leaves from where it was cut. Remove the lower leaves when they begin to yellow. Re-pot the Plant once very 2 -3 years during the spring season. It has no serious pest or disease problems. Watch for spider mites, mealy bugs, thrips, and scale. The most widely recognized plant diseases that affect the Plant are fusarium root and stem rot. It can be easily propagated by stem tip cuttings. Take 4 – 6 inches stem tip cuttings in spring or summer and pot them in the moist potting mix. You can also cut a new or old rosette and re-plant it. After replanting keep the soil moist and mist the leaves which will encourage the plant to grow. A tall plant can be propagated using the air layering method.